Haia, BLOD yma eto! Ydach chi’n fy nghofio i? Fi di’r eneth o Ogledd Cymru! Cawsom wasanaeth yn yr ysgol ac fe wnaethomddysgu am Mary’s Meals. Gwelsom luniauo’r plant tlawd mewn llefydd fel Affrica. Roeddynt yn edrych mor hapus wrth dderbyn eu bwyd. Mae’n anhygoel meddwl mai dim ond 6c mae’ncostio i fwydo bachgen neu eneth sy’n llwgu. Fedrwch chi helpu VEG i godi arian wrth glicio yma. Gobeithio bod VEG yn mwynhau ei gwyliau! Dyma ginio heddiw: fy hoff brif gwrs ar y fwydlen gyfan. Dwi ddim yn siŵr beth mae’n cael ei alw ar yfwydlen ond dwi’n ei alw’n ‘cheesy pasta bake’. Cefais fresych o ardd yr ysgol a phys melys. Hefyd cefais salad a bara tomato blasus iawn. I bwdin cefais grymbl afal a chwstard. Bron i mi anghofio. Mi wnes i osod her i chi ddoe. A wnaethoch chi ddyfalu beth oedd ycynhwysion dirgel yn y muffin? Cafoddrhai ohonoch yr ateb yn gywir - da iawn chi! Yr ateb oedd tatws melys a betysen o’r ardd. Hi, BLOD here again! Remember me? I’m the one from Wales! We had an assembly in school and learnt all about Mary’s Meals.We saw pictures of all the poor children in places like Africa. They looked so happy to be getting their food. We were amazed to learn that it only costs 6p to feed a starving boy or girl. You can help VEG to raise money by clicking here. I hope she is enjoying her holiday! Here is today’s dinner. It was my favourite from the whole menu. I’m not sure what it is called on the menu but I call it ‘cheesy pastabake’. I had some cabbage from the school garden and some sweetcorn. I also had salad and tomato bread which was very nice. For dessert I had apple crumble and custard. Oh, I almost forgot. I set you a challenge yesterday. Did you guess the secret ingredient in my chocolate muffin? A few of you got it right so well done! Actually there were two secret ingredients: sweet potato and beetroot from our garden. "If you want to eat in school (not everyone does, a lot of pupils bring their own lunch box) you have to order your lunch at the late stone day before. Everyday we can choose one of three warm options (one of them vegetarian), or we take a salad. We can also choose milk (strawberry, vanilla,choco or full-cream milk). Most timethere is a dessert or a starter for each meal. Normally you're not allowed to choose another one that's not with the lunch you ordered. But the women in our dining hall (we call them "Essensfrauen", that's a little bit like "lunchwomen", what do you call them?) are nice, so we can choose another one if we want. Otherwise they would just throw it away, because there's too much every time. I chose the macaroni with cheese sauce and ham sausage and took the tomato salad, but I didn't choose milk today. BLOD here again. Yourmacaroni cheese looks tasty. A bit like my cheesy pasta bake! The ham looks really fresh, I bet it was very nice. The tomato salad looks like salsa, which I quite like. 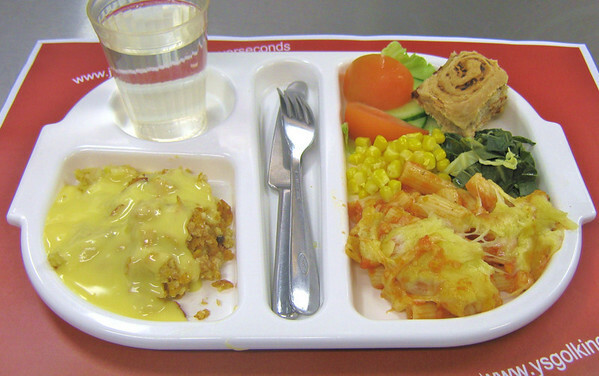 We don’t have three types of meals to choose from because Ysgol Kingsland is a fairly small primary school, but there is always a vegetarian option and halal food too. Also, there is bread and salad available every day. 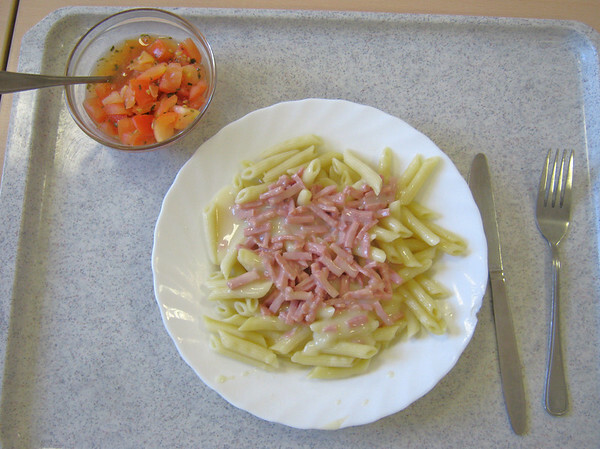 My headteacher says that our proper word for “Essensfrauen” is “midday supervisor”,but we call them “dinner ladies”. I’m almost finished for the day. Just one more thing. Because you seem to like a mystery and I like reading your comments, I wonder if anyone can guess what the“stickers” are I’m counting when I do my rating? Today it was 0 again for me :-( I will explain tomorrow! Is it the little round stickers on some fruits? I like your language! How about recording your next post in your language and posting it to "hear"? I guess, if you find a sticker on your plate, you can collect them and if you have 10 stickers, you can choose an extra (like icecream or something like that)? Plans are afoot to record a post before the end of the week! You'll have to wait until tomorrow for the sticker answer though! TR, I am eagerly looking forward to the recorded post! l really enjoy reading the blog every day and appreciate the time all of you take. Hmm, perhaps you did not get a sticker as you did not finish your meal? If so, I don't think that is fair, you had a good selection of food and did not try to have three desserts or something! Yes, I like a mystery! I think Daria has the right idea, it could be the stickers from whole fruit. One would not get a sticker for fruit used in a recipe as this dessert is as it has been adulterated. BLOD your lunch looks delicious! It's great that the kitchen staff are using school grown produce too. You're doing a great job here, well done. I guessed beetroot but not the sweet potato. That's a great idea! I love the fact that you grow some of the food that you eat and your dinners look really tasty. My 2 boys (8 and 5) are growing carrots at home. Only problem is that they love them so much that there are hardly any left come dinner time to cook! I guess stickers are for finishing all your dinner although I don't really agree with that kind of incentive. Eating healthily is more important and your meals do look healthy too. Really enjoying your turn at the blog BLOD! I think the stickers are either for finishing everything or ele they are hidden somehow, but either way you hasve to collect them and then when you have so many - say 10 or 20 - you get a free lunch. But I have a question. Your tray seems to be sitting on a mat but it has the web address of the Just Giving page for never Seconds. have these been specially printed? Yes, we thought we'd print the mats out especially for this week - any opportunity to keep raising awareness of VEG's wonderful campaign! What an amazing blog! We will be talking about this on my radio show tomorrow. My name is Cara Perkins and I am a radio personality in the United States with a health show that can be heard all over the world on www.fbrn.us every Wednesday 11:00am-1:00pm central time in the Blue/Talk Bowl. We are going to talk about health care, how to prepare kids to be healthy adults and school lunches. Please feel free to email me anything you'd like me to mention on the show at cara@caraperkins.com or you can call in at 214-431-5062. I think you might be 6 hours ahead of us. I have 2 cohosts, Jared is 12 years old and Bryan is 20. They help me get the word out to parents and kids to teach people how to eat healthy. I'm suddenly in the mood for a big plate of "cheesy pastabake"! Keep up the good work BLOD! Hello again BLOD! That apple crumble looks amazing. I would have a hard time not eating it first! I have no idea what the stickers were fore, the closest thing we ever had to stickers in my school was something we called Lucky Dot Day which happened about once a month. On Lucky Dot Day the Cafeteria staff would hide small dots on random trays and put hamburgers on top of them. If when you got to your seat you discovered a Lucky Dot on your tray it meant you got an ice cream bar for free! I would also love to hear Welsh spoken. I must admit I don't know how to properly pronounce most of the words you wrote in Welsh but I would love to learn! I guessed spinach for the secret ingredient. Did a loose sticker just end up in someone's dinner once? Hello Blod, My name is Joshua Mullins, I live in Texas. Can you send an email to Veg asking her where in Texas she will be visiting? I would like to meet her. Thank You. Hi Joshua. We're looking forward to reading about the dinners in Texas. I don't think VEG will actually be there herself though, it will be a guest blogger entertaining us all for the week! I think that stickers are put on one or some of the lunch trays, but not all, and that if you have one on yours you get some sort of treat. Am I right? If you have fruit you might get stickers on those - my Dad would stick the banana or apple sticker on my nose or forehead! Ooh your blogs are so challenging, BLOD! I think you get a sticker if you finish all your dinner? I was never very good at finishing my dinner when I was at school (I'm only a bit better now...), so I sympathise if that's why you haven't been given a sticker! Looking forward to the answer, hope it comes soon, I'm not very good at being patient either! Are the stickers the tiny ones that are on the bottom of things that say "Made In ..."? At my school,we get to choose what we get for lunch,diffwerent things have different prices. Comments: Very tasty but too many chips! After I had eaten my lunch I bought a cake from a cake sale at school!